Sydney dwelling values fell by -4.5% over the 2017-18 financial year. Core Logic has released their newest housing market update for July 2018. You can also check out the local reports for Brisbane and Melbourne. This was the largest financial year fall on record. 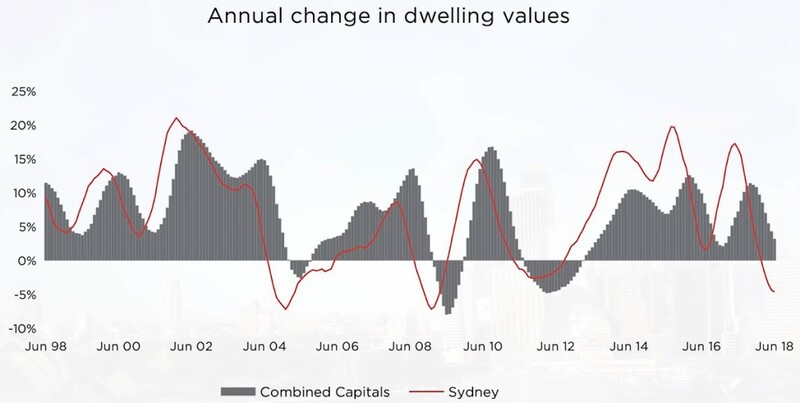 The reversal in Sydney`s housing market performance is stark when considering that a year earlier values had increased by 16.4% over the financial year. Despite the recent year on year fall, Sydney dwelling values remain 54% higher than they were five years ago. The weakest conditions are confined to the premium sector of the Sydney housing market where values across the upper quartile of the market are 7.4% over the year while the most affordable quarter of the market has seen values fall by a less significant 1%.